***<NerdGasm>*** This recipe was mentioned on NPR’s Morning Edition! ***</NerdGasm>*** When it comes to pumpkin pie my friend Patrick says it best, “In my book it’s the only pie.” Some of my most vivid childhood memories are of Thanksgiving at my grandparents’ cattle ranch and pecan orchard in north central Texas. I remember the cool fall air and the peaceful quiet of the Texas countryside, but that memory is not my most vivid. I remember watching the cattle search for those last few blades of green grass under pecan trees that had long given up the last of their leaves, but that’s not what has stayed with me. I remember watching the occasional deer or wild turkeys as they followed the creek bottom that snaked its way through the pastures, but even that isn’t my most vivid recollection of childhood Thanksgivings. What I remember most about childhood Thanksgivings is thinking that pecan pie is a goddamn waste of a perfectly good pie crust. Texas is all about pecan pie, and I admit that as an adult I’ve come around to enjoying my fair share of slices, but pumpkin pie is, and will always be, my first pie love. The pie in this recipe is made with a ginger snap crust. 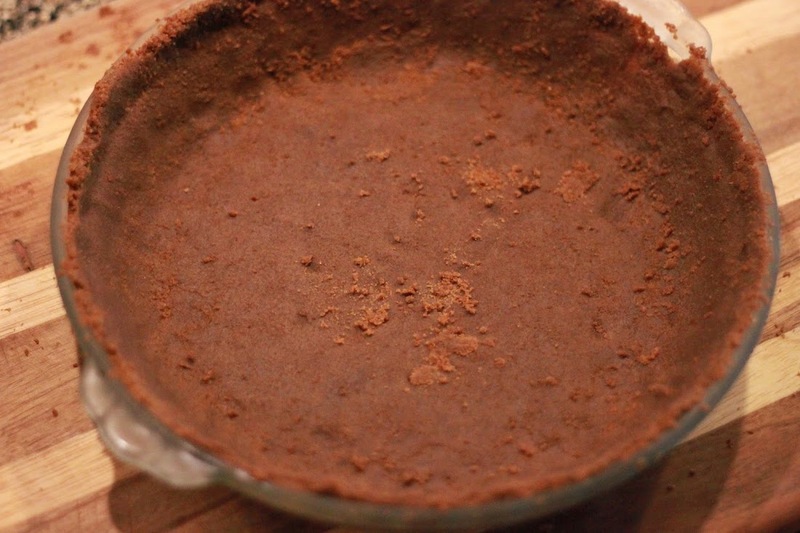 It can be made with a store bought crust, graham cracker crust, or whatever you prefer, but the ginger snap flavor works so well with the spices in this pie that I will not make it any other way. 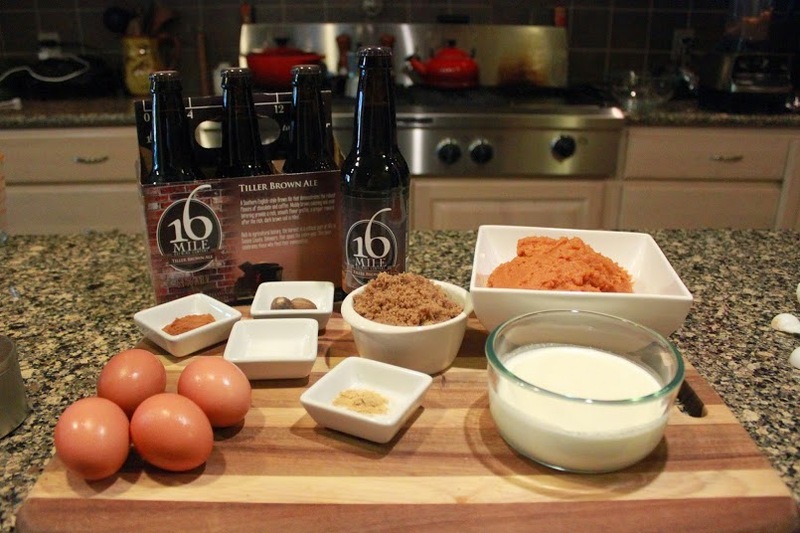 For the beer I’ve chosen Tiller Brown from 16 Mile Brewing in Georgetown, Delaware. This beer has a complex malt flavor of chocolate, roasted nuts, and a hint of coffee. It’s basically perfect for a pumpkin pie. 1. Preheat the oven to 350F. 2. 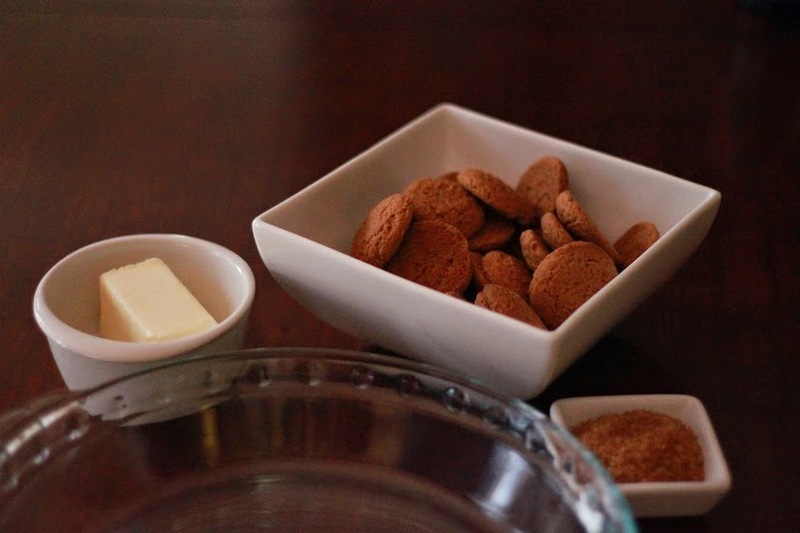 Place the gingersnaps and sugar in a food processor and process until they are reduced to very small crumbs. 3. Add the melted butter and pulse until combined. 4. Place the mixture into a 9-inch pie pan and press into the bottoms, sides, and lip of the pan. 5. Place the pie pan on a baking sheet and bake for 12-15 minutes. 1. Preheat oven to 350F. 2. Place the pumpkin puree in a saucepan and simmer over medium heat until it thickens slightly, about 3 minutes. 3. Add the cream, beer, salt and spice to the saucepan. Stirring so it doesn’t burn, bring the mixture back to a simmer then remove from the heat. 4. You still have half a beer. I trust you know what to do. 5. Let the mixture cool for about 8-10 minutes. Meanwhile, whisk the egg yolks, egg, and sugar together in a bowl. 6. Whisk together all of the ingredients until well combined. Pour into the pie crust and bake on a baking sheet. The pie will be done baking once the sides are solid but the center still jiggles, about 45 minutes. 7. Place on a cooling rack and let cool for 3-4 hours. The center of the pie will firm up as it cools. 8. Feel free to serve the pie after it has thoroughly cooled, but I recommend refrigerating this over night. And don’t forget, fresh whipped cream never hurt anyone! 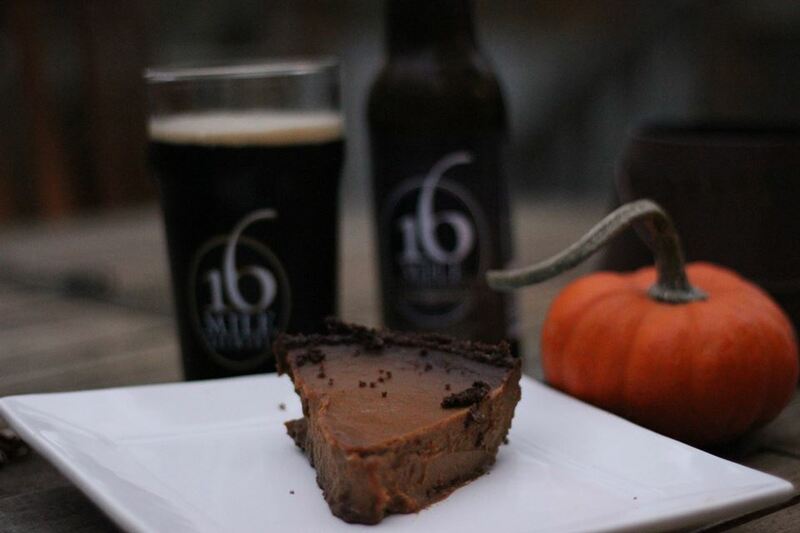 Check out Chesapeake Inspired magazine’s Thanksgiving beer pairing guide for the perfect beer pairing.